WASHINGTON (June 24, 2015) – Each year in the United States, suicide claims over 41,000 lives – more than war, murder, and natural disasters combined. 22 veterans die every day by suicide. 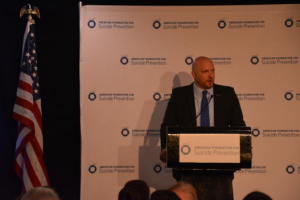 On Tuesday, June 23, 2015, the American Foundation for Suicide Prevention, the largest suicide prevention organization in the United States, presented with an AFSP Allies in Action Partner Award to Paul Rieckhoff, CEO and Founder of Iraq and Afghanistan Veterans of America for his exemplary work in suicide prevention and access to mental health care services for Iraq and Afghanistan veterans. More than 240 AFSP volunteer field advocates from all 50 states were in attendance as part of the organization’s Advocacy Forum. Mr. Rieckhoff is being recognized for his efforts in leading the charge to help returning Iraq and Afghanistan veterans assimilate back into our country while helping them cope with health, employment, housing and other needs. Suicide prevention is one of the six public policy priority focus areas IAVA is working to impact under Rieckhoff’s leadership. Rieckhoff resides in New York. One in five people who die by suicide are veterans. The military suicide rate has doubled since 2001 and has remained unacceptably high – appears higher than the adjusted civilian rate. Every military sector has experienced an increase – active duty, National Guard, and Reserve forces; impacting the Army, Marines, Navy and Air Force. In general, for every suicide death there are at least 4.5 suicide attempts and multiple surveys indicate that almost everyone in the military knows someone who has attempted or died by suicide. Rieckhoff was recognized with this award along with Linda Rosenberg, President and CEO at the National Council for Behavioral Health and Yochi Dreazen, author of The Invisible Front: Love and Loss in an Era of Endless War. The American Foundation for Suicide Prevention leads the fight against suicide. We fund research, offer educational programs, advocate for public policy, and support those affected by suicide. Led by CEO Robert Gebbia and headquartered in New York, AFSP has 75 local chapters with programs and events nationwide. Review our Annual Report to learn more about AFSP’s life-saving work, and join the national conversation on suicide prevention by following AFSP on Facebook, Twitter, Instagram, and YouTube.